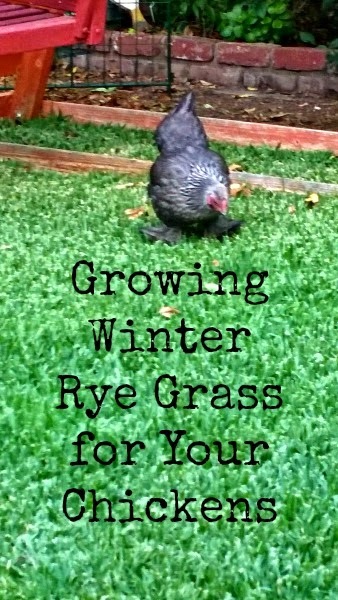 If you are raising backyard chickens, I have a great winter forage source for you, winter rye. Every fall I seed my back lawn with winter rye grass seed and it takes off quickly providing a food source for my chickens. Rye grass is high in nutritive value and tolerates chickens grazing on it. Every morning when I open the coop, I let the girls out for some green grass munching. Even long after my St. Augustine lawn dies back from colder temps, the rye stays green and gives the chickens a constant source of greens through the winter. If you live in an area where it snows, I imagine you could grow it in trays. Once it is eaten down it will rapidly grow back if the trays were rotated. I m new to "chickening" and was wondering how many chickens can eat from one tray of fodder? If you have a large feeder than quite a few. I had an average size feeder with 5 chickens.